Thyme for Cooking Weekend Menu: Vitello Tonnato, easy recipes. We've been doing a lot of French summer foods; I thought it time to visit more of the Mediterranean. Last night was a hint of Spain, tonight an Italian summer favorite: Vitello Tonnato. I know we often have foods that need some early prep time, but with this dinner, the entire meal is best prepared early in the day and left for the flavors to meld... Which makes it perfect for a summer picnic, entertaining, or a late evening dinner after a long day at the beach or exploring the local summer markets. This is properly made with a veal roast that is braised for hours, then sliced thinly and served with the sauce. This is my shortcut version.... Summer cooking! 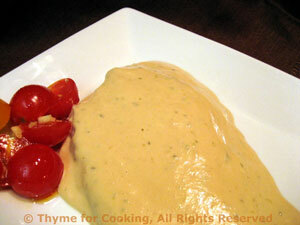 I've included the traditional Tonnato Sauce as well as a version using commercial mayonnaise rather than the raw egg. Heat chicken stock in a medium skillet. Add veal slices, a few at a time and poach briefly, until cooked through. If they are very thin and the stock hot, it should only take a few minutes per slice. Reserve stock and allow to cool. Put all ingredients, except poaching liquid, into a blender and purée until smooth. Pour into a bowl. Add some of the cool poaching liquid, 1 tbs at a time until the sauce is the consistency of very thick cream. 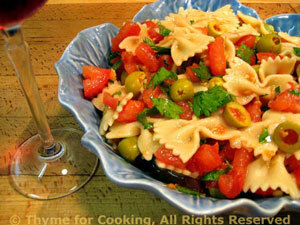 Pour a thin layer of sauce to cover the bottom of a large platter or baking dish. Lay the cooled veal slices over the sauce, trying not to overlap. If you must overlap put a layer of sauce between the meat. Pour the rest of the sauce over the veal, smoothing it to cover the veal completely. Put 1/4 cup oil, egg, tuna, anchovies, 1 tbs capers, mustard and lemon juice in the blender. Cover and blend on high speed a few seconds, until pureed and smooth. Remove 'cap' from blender top and, with blender running slowly, drizzle in the rest of the oil. Sauce should be thick and smooth and total blending time not more than 10 - 11 seconds. Pour into a bowl. Slowly stir in the cream or milk. Add some of the cool poaching liquid, 1 tbs at a time until the sauce is the consistency of very thick cream. Stir in the rest of the capers. If you prefer you can purée all of the capers - which I did, (albeit, accidentally). 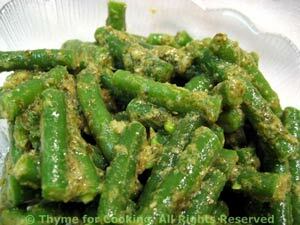 Basil and beans are another classic pairing... So why not pesto and beans? Make sure to use a good quality olive oil. Mix olive oil and pesto in a medium bowl. Add beans, toss to coat and refrigerate until ready to serve. Add oil, stir, cover, set aside, room temp.